Digital Dining table service POS has more control – everywhere. Taking care of business with the Digital Dining’s Table Service POS will have you operating at peak efficiency, turning tables faster and encouraging your customers to come back again and again. Security is at your fingertips with Fingerprint ID. Accommodate customer needs quickly with features like one-touch split check and split item, and keep them coming back for more with Frequent Diner rewards and smart coupons. And that’s just the start! Add the Digital Dining Go Mobile and make your table service POS unbeatable! Have all the functionality of a desktop terminal in the palm of your hand. Digital Dining’s Handheld POS allows servers to handle more guests efficiently, reducing labor cost and increasing speed of service and profits! We will custom design the Table Service POS with your operation in mind! Digital Dining can accommodate all types of table service – either graphical through your graphical table layout, by table number, or by check number. Select the features you need for particular types of table service POS stations based on staff departments, times of day, and days of the week. Say goodbye to fixed layouts and canned POS server reports – with Digital Dining you can customize all POS printing for checks, prep tickets, coupons, clock in and clock out slips, and server reports – it’s all under your control! Digital Dining’s wireless handheld POS for table service restaurants enables restaurant servers to receive and send orders without ever leaving the dining area or running to and from a stationary terminal. Digital Dining works on Windows, Apple iOS, and Android! Integrated credit and debit streamlines transactions making them more efficient, prevents server entry errors, can reduce payment fraud, and practically eliminates the time to reconcile electronic payments. Armagh POS Solutions has multiple Canadian processors available that provide integrated pay-at-table. Servers can recall checks and accept credit cards for partial payments, split a check between multiple customers, and all wirelessly at table-side. Whether you are new to Gift Card or have an existing gift card program, we’ve got you covered! Our experienced technical support staff can examine your existing gift card program to see if we can reuse your existing card media and convert your existing liability to Digital Dining. If you don’t yet have a gift card program, we can help you design a custom gift card that leverages the marketing collateral of your restaurant brand. Optionally sell “virtual gift cards” online using our turn-key online gift card program. Prefer gift certificates instead? No problem! Digital Dining can sell and track gift certificate numbers and ensure that your certificates are being properly tracked and managed. Bartenders don’t need to worry about transferring a bar customer to a table with Digital Dining! Transfer a single check, multiple checks, or all of the open checks from one staff member to another. Table staff can even transfer menu items between guest checks. All transactions are done securely with an audit trail. Need to stay connected to your restaurant 24/7? Digital Dining’s optional mobile reporting app is what you need! Download our app from the Apple Store or from Google Play and connect to your restaurant’s data stored in the cloud whenever you need information. Improve your mobile control by assigning a variety of reporting criteria and receive automatic alerts for key metrics such as the total # of checks, tables, sales, voids, refunds, and more. On or offsite, with Digital Dining, you’ll never miss a beat again! Lots of table service restaurants have a significant take away business. Your table service staff can manage this with ease, either controlling the take out order entry manually or through timers. Your kitchen will know it’s for takeout because Digital Dining can customize the prep print out for the take out order so they recognize it every time! Track your take out orders to a separate profit center, so that your can report on it at the end of the month to see how that facet of your business is progressing. Whether for take out or delivery, Digital Dining has your online ordering needs covered! Our turn-key solution allows you to customize your online menu and post it on your existing website for use by both desktop and mobile browsers. Don’t have a website? No problem! We can allow your customers to order online through your Facebook account! Pay online or instore for pick up orders, curbside, or delivery. Orders automatically print in your restaurant’s kitchen with customized layouts so that your staff never mistake an online order ever again! Finally, track all your online ordering to a separate profit center so you can accurately report on it later. Hold selected menu items, such as entrees, so they do not print in the kitchen immediately. Servers can control when they will print manually, or items can be controlled by a timer. Using a feature called, “Future Orders” service staff can send held items to the kitchen by setting a time of day or a day of the week on a timer. Create and track a variety of promotions using Digital Dining’s electronic coupon system! Create and send coupons to customers that are trackable to their unique customer profile. Create coupons with whatever criteria and control you prefer, including one-time or multiple use, set expiry dates, coupon amount and included items, customer level control, and more. Digital Dining reports track coupons by campaign and by customer so that you know what promotions are working and what promotions don’t. No need to use the disfunctional “line method” to separate your Appetizers or Entrees! 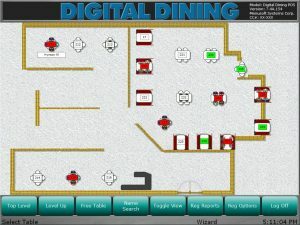 Digital Dining handles courses automatically by seat at the item level, and communicates the courses clearly to the kitchen with ease. Need to serve an appetizer as an entree? No problem, simply use the “Change Course” feature and switch the item to the correct meal course. Think you need to have a fancy fine dining restaurant to make automatic coursing useful? Think again. Our most successful restaurant users are pubs and casual dining establishments. 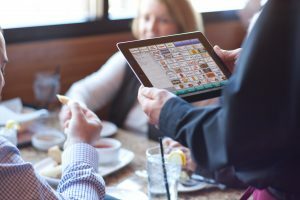 Digital Dining thrives in fast casual table service restaurants – let us show you! Nothing provides higher security with more convenience. The Fingerprint ID allows staff to clock in, clock out, and perform functions like voids and refunds based on their security levels. Eliminate costly “buddy clocking”, abuse of discounts, coupons, House Charge and paid outs, and protect literally any feature in Digital Dining with fingerprint security. 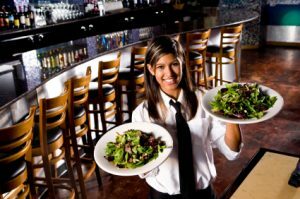 Is your restaurant too small to have a manager on staff at all times? No problem! Fingerprint ID can be used to provide the owner with 100% identity confirmation on any function used in Digital Dining. The graphical split check feature allows table servers to separate checks by person manually. The POS then calculates the total for each order and prints separate receipts. Servers can split menu items between two or more customers by using the Reorder feature. The POS creates separate checks and calculates their totals before or after an order is sent to the kitchen. Use the Item Out Alternative feature to stay updated on out-of-stock menu items. If a customer orders an item that is out-of-stock, the POS can suggest an appropriate alternate item.